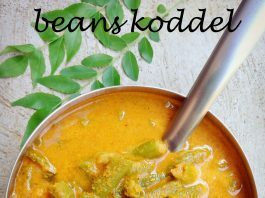 beans koddel | beans huli | beans sambar | udupi-mangalore style beans koddel with step by step photo recipe. 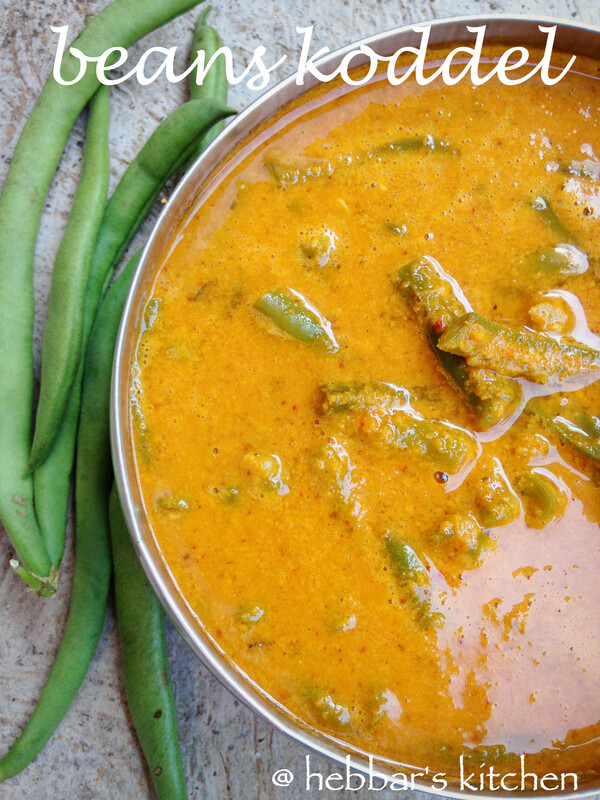 beans koddel is one of the most popular sambar in udupi- south indian brahmin home. the flavours of masala are fresh and mild. i am big fan of typical udupi sambar recipes: bende koddel, majjige huli, basale koddel, gulla koddel, padipe saasmi, pumkin sambar, drumstick sambar etc. 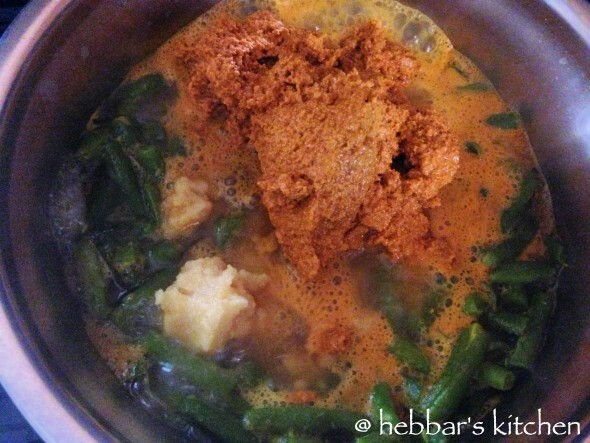 beans sambar can be prepared with freshly ground masala or if you are in hurry then you can use udupi sambar powder. 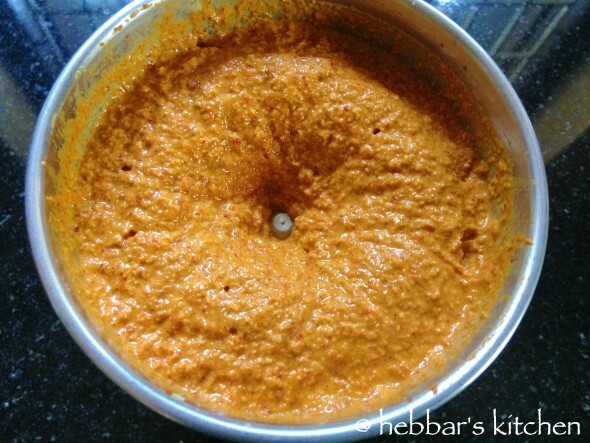 however, i recommend you to prepare masala freshly to get the authentic udupi style sambar. if you do not like beans, you can replace with the vegetable of your choice. 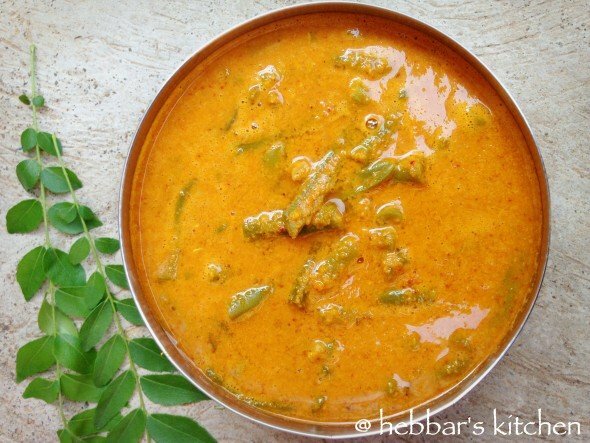 also check out my other rasam recipes like pepper-garlic rasam, punarpusi saaru, udupi saaru, tomato-onion rasam, kat saaru, huruli saaru etc. 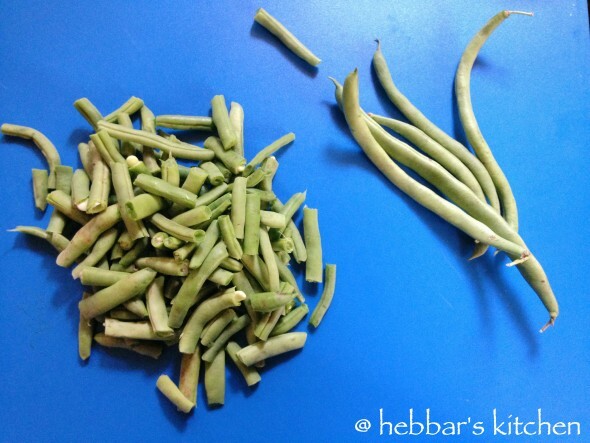 chop all the beans to 1 inch long pieces and keep aside. wash and pressure cook toor dal with required water till they are completely cooked and soft. 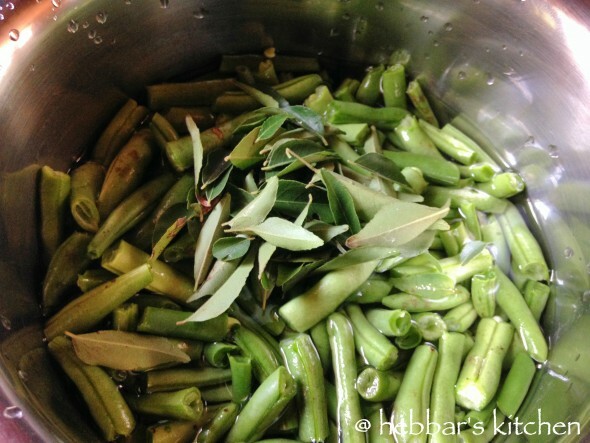 take 1 cup of water and add all chopped beans along with curry leaves. 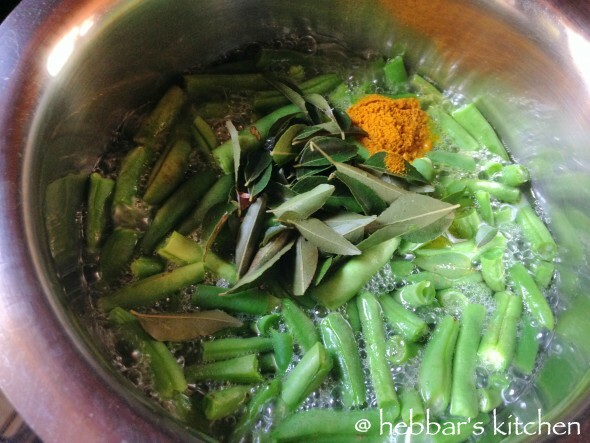 add a tsp of turmeric powder and mix well. close the lid and allow to cook for 5 min. don't overcook the beans too. meanwhile, roast cumin seeds, urad dal, coriander seeds and red chillies with a tbsp of coconut oil till you get a nice aroma. allow it to cool completely. 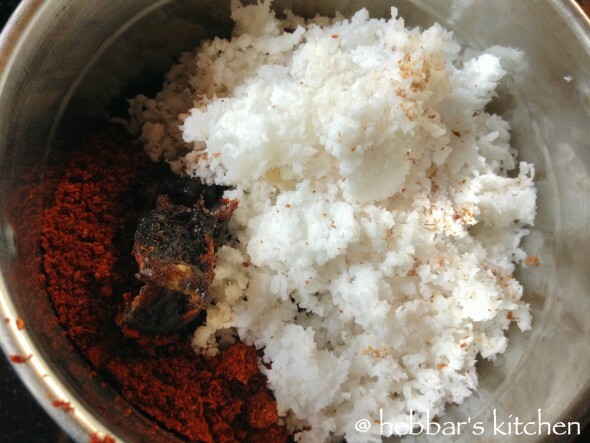 and in a blender take roasted masala, coconut, few curry leaves and tamarind. blend it to a smooth paste adding required amount of water. 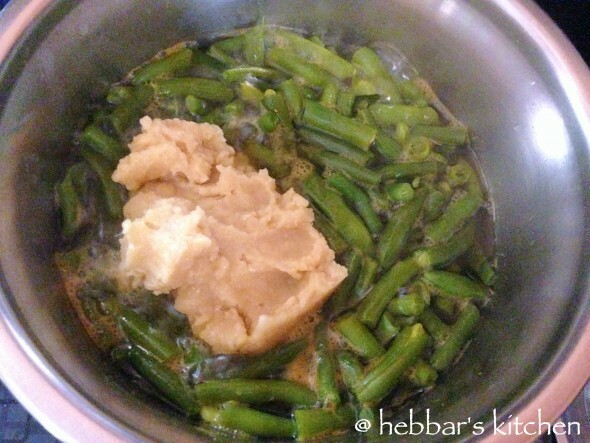 once the beans are cooked add jaggery and salt. bring this to a boil. now add cooked smashed dal. also add the ground masala and cook for 10 minutes on a medium flame. 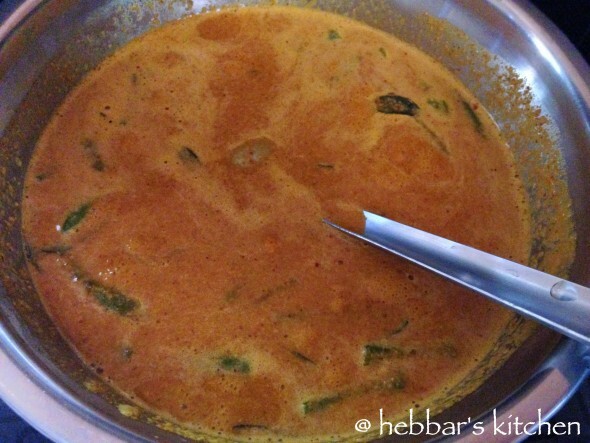 make sure the coconut gets well cooked and the aroma of the sambar rises. add a tsp of turmeric powder and mix well. close the lid and allow to cook for 5 min. don’t overcook the beans too. 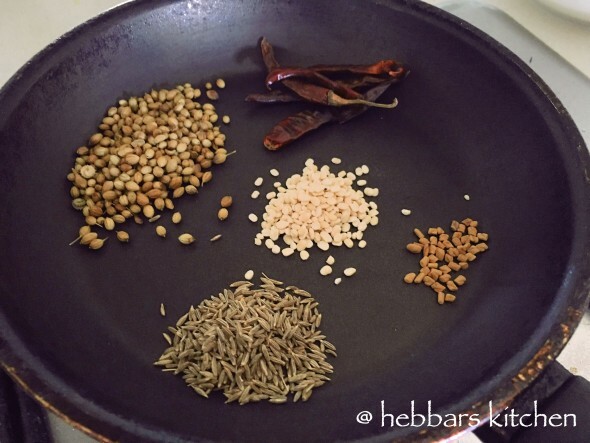 mash the dal before you add to sambar. 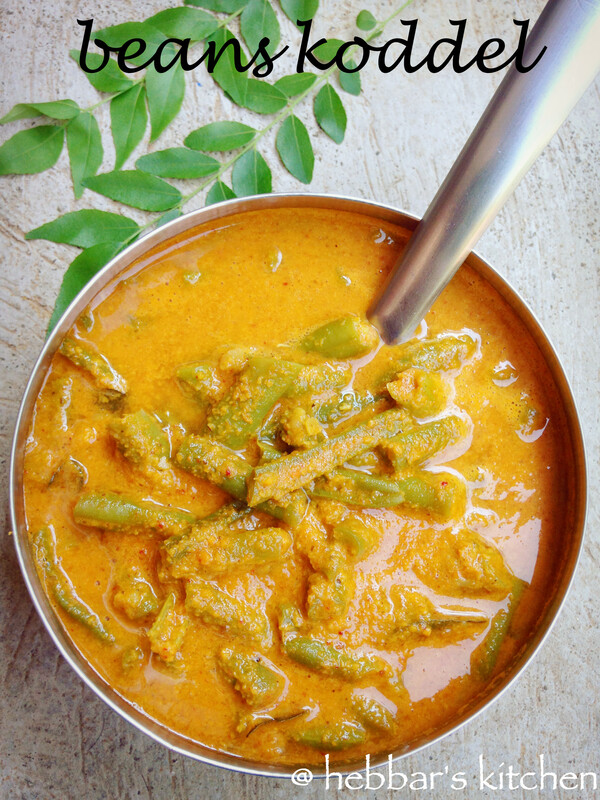 you can alternatively use sambar powder instead of roasting the masala. tempering with ghee gives nice flavour. 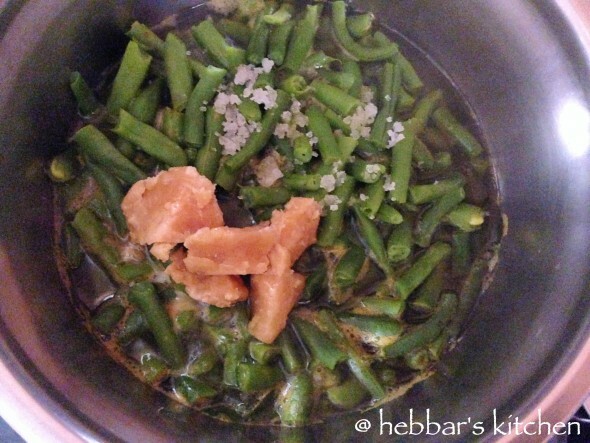 Is recipe ka video upload kijiye na plzz..
Hebbarji excellent recipe’s.Well explained.Easy to understand.Every recipe is yummy.May God bless you…. thanks a lot for those kind words.